Ann Delcollo | Ciccarelli Law Offices, a Pennsylvania Law Firm based in suburban Philadelphia (West Chester PA) and serving all of Pennsylvania for Civil and Criminal Litigation matters. 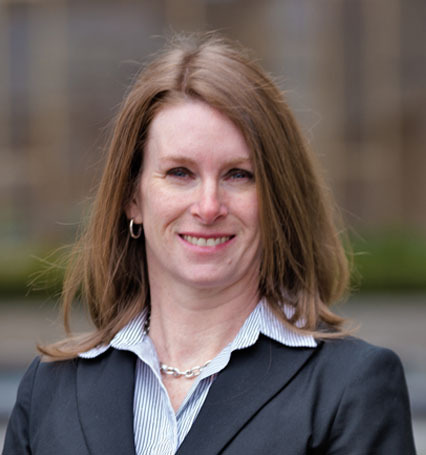 Ann is an experienced trial attorney who learned her craft in the tough courtrooms of Philadelphia. Ann has been advocating for her clients, in and out of the courtroom, since 1992, and is a proud member of the litigation team at Ciccarelli Law. Ann is admitted to the bars of Pennsylvania, and the United States District Court for the Eastern District of Pennsylvania. She earned her juris doctorate from Widener University School of Law, while working as a law clerk for a litigation firm in Philadelphia. After graduation, Ann accepted a position with the firm she clerked for, and began her litigation career working with the firms’ partners defending medical malpractice, personal injury, and asbestos lawsuits. From there she moved on to accept a position as trial counsel for Allstate Insurance Company, and later, as senior trial counsel at Nationwide Insurance Company. Ann also worked as trial counsel with a firm in Chester County, handling criminal defense, plaintiff’s personal injury, and social security disability cases. During her 16 years as a “Philadelphia Lawyer”, Ann served as an arbitrator and as a Judge Pro Tempore for the Philadelphia Court of Common Pleas. As a Judge Pro Tempore, Ann conducted settlement conferences and guided the parties through settlement negotiations. Ann was invited to present continuing education seminars for attorneys on the art of cross-examining expert witnesses, and the arbitration process in Philadelphia County. When she is not advocating for her clients, Ann advocates to improve the lives of the millions of children and adults battling Type I Diabetes. A biology major in college, Ann sought out programs that were dedicated to diabetes research. She spent the summer after her junior year at Vanderbilt University, studying protocols for improving the efficacy of synthetic insulin. She is currently a member of the Board of Directors for the Juvenile Diabetes Research Foundation (JDRF), where she serves as the chair of corporate fundraising. Ann also volunteers her time as a member of the planning committee for the annual JDRF Hope Ball, which is the organizations largest annual fundraiser. Ann and her husband have three sons (and two black labs), and reside in beautiful Chester County. Ann will often be seen on the sidelines of a football, basketball or baseball game, and has volunteered as a youth basketball coach for the Kennett YMCA. Ann also enjoys running, and in 2015 completed the Megatransect, a 27.5 mile, ultra-trail marathon in her hometown of Lock Haven, Pennsylvania. The DelCollo family are avid Eagles, Phillies, and Penn State fans, and enjoy attending the Penn State games with season tickets that have been in the family since the 1950’s.